Although the weather might not exactly be giving this indication, Spring is finally upon us! And with Spring comes Rose season… joyous day, hallelujah, amen! I find that as I grew older, and my palate matured, I became more and more drawn to these subtle little beauties that are Rose. I love them in all shapes and sizes… err, I mean varietals. Whether it’s an Italian Rosato of Nebbiolo or Aglianico, a Spanish Rosado of Monastrell or Garnacha, a classic Rosé de Provence from southeastern France, or a domestic gem made from Zinfandel, Grenache, Pinot Noir… you name it. One Rose in particular that I look forward to this time every year is Sean Minor’s Four Bears Vin Gris from Carneros. I’ve written about Sean before, and I warned you that this was going to be a ongoing theme… his wines are simply too good to NOT talk about! I’ll never forget a moment a little over a year ago when I was having a chat with Sean and I asked him how he can possibly charge so little for his wines when they’re so good. He looked at me and said “The cost of wine can be broken into three parts. One third is what you need to keep your winery operating: pay the workers, buy the equipment, the barrels, etc. One third is what the owner needs to pay his or her own personal bills: car payments, mortgage, kids college funds… And the final third, well, the final third is greed. We just take the greed out of winemaking.” Well, that certainly explains it! How else could he have a Napa Cab that’s under $20 on the shelf, or a killer Chardonnay in the low-teens!? Sean, and his lovely wife Nicole, just want to make wines that the average consumer can afford, and that over deliver for the price. With the Vin Gris he’s not just over delivering, he hit the ball out of the damn park! The Vin Gris is made from 100% Pinot Noir from Carneros, one of my favorite growing regions for Pinot in California. I find the wines from there, the good ones at least, to be super expressive and very interesting. In the glass you find a light bodied wine with a pale salmon hue… not entirely pink, it has just a shade of copper to it as well. The bouquet exhibits distinct aromas of strawberry and watermelon rind, as well as subtle hints of macerated cranberry and lemon zest. On the palate the entry is purely ripe strawberry, then moving into the mid palate and finish you are presented with crisp acidity, as well as nuances of tart cherry, ripe raspberry and the faintest expression of crushed granite, leading into a surprisingly long finish. The production on this wine isn’t exactly small, but at the same time Sean doesn’t make a ton. If I remember correctly stores in the New York and New Jersey markets were already sold out by early June last year, except for the few that were smart enough to stock up. So the point I’m trying to make here is that when you find it, don’t just buy a bottle… buy six, buy a case, buy two cases! This year I plan on buying two cases to get me through the Summer, and I will not be sharing with friends or family. If I did that I would need three or four. So let’s talk food pairings. The wine is super light and pretty, so you won’t be having this with steak or BBQ. Ideally I prefer this Vin Gris with fare such as tuna tartare, oysters with mignonette or Champagne vinaigrette, raw Hamachi, lightly seasoned seared white fish… you get the idea. In other words, it’s PERFECT to bring to a sushi bar or seafood restaurant! Or, forget the food and just drink it by itself… Just be careful, on a warm day, sitting by the pool, you could finish a whole bottle by yourself without even realizing it! Last but not least… scores. Sean doesn’t submit this wine to be scored by the big boys like Bob Parker, Antonio Galloni, and Tanzer. There’s no point. He doesn’t make a ton of it, and it sells out every vintage without their help. However, to keep with the theme that I have set down in previous articles of “A wine you should know…”, I have to give it my own score. Truthfully, I very rarely consider wines in this price point to be deserving of a score above 90. I always find it absurd when you see a bottle on the shelf for $9.99-13.99 with a 93 point score from whoever, especially when there are wines two shelves above with 93 points that are $49.99. Obviously one is not going to be the same quality as the other. Not saying that more expensive wines are better by default, but let’s face it, they are more expensive for a reason. However, with all of that being said, I also feel that in this scenario I can’t categorize the wine by its price point, as its quality far exceeds its price tag. So my score for Sean Minor’s Four Bears Vin Gris, 91+ points. So that’s my review. Hopefully you liked it, and hopefully you’ll go to the store and buy the wine! I know Sean and Nicole would appreciate it, especially since they have four kids to send to college… Oh yeah, those are the “four bears”. Thanks for reading, I’ll have new content up soon. In the meantime, crack open a bottle of Rose regardless of the weather, sit back, and relax. Life is short, enjoy it! 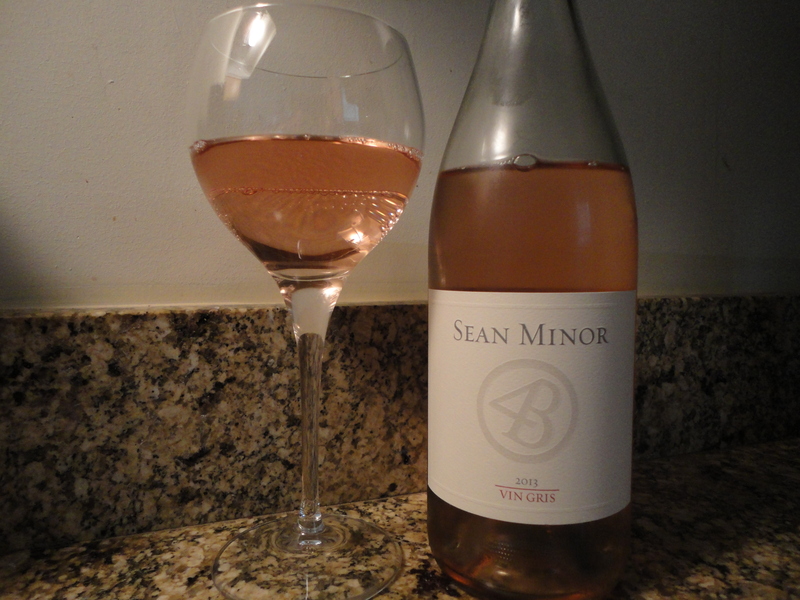 Tags: rose, sean minor, vin gris, wine. Bookmark the permalink.